Directory of Schools and Programs for Troubled Teenage BoysOne of the most important parts of finding the right school or program to provide troubled teenage boys with treatment is having access to a directory with the right information. With this in mind, Triangle Cross Ranch has provided this directory of schools and program that serve troubled boys so that parents can make a well informed decision. These programs each take a different approach towards helping troubled teenage boys recover from their issues, making it essential to choose the option that will best fit your son. If you have a troubled teenage boy dealing with substance abuse, anger, violence, depression, poor school performance, or a wide variety of other issues, you can find the help you need below. 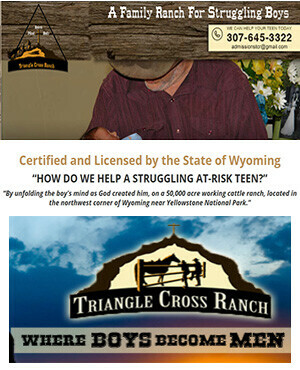 If you are in need of further information or are interested in the help Triangle Cross Ranch provides, we urge you to contact us as soon as possible at (307) 645-3322 . We are confident that our extensive experience will allow us to guide your troubled teenage boy through his difficulties in the best way possible.